Do you need a better way to manage your blog content? Looking for a tool to outline your blogging workflow from beginning to end? In this article, you’ll discover how to effectively organize how you brainstorm, write, and publish your blog’s content with Trello. 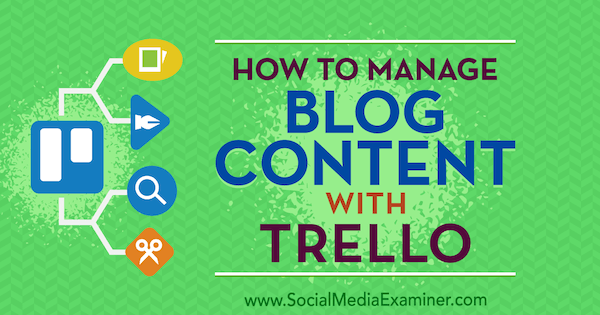 How to Manage Blog Content With Trello by Marc Schenker on Social Media Examiner. Start by signing up for a free Trello account. While paid plans are available, a free plan is more than sufficient for producing content for your blog. 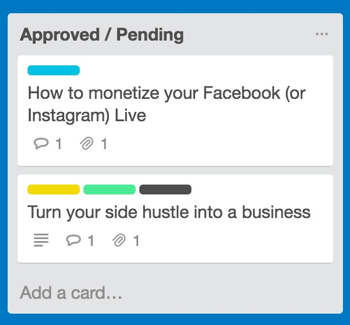 If you’re new to Trello, it’s a good idea to first read this article on getting started with Trello. Once you’ve signed up, you’ll have access to the main board and teams page, which is the hub for all of the boards and teams of which you’re a member. Boards are the main interfaces of Trello; you’ll be spending the majority of your time here. If you have a blogging team, you’ll control blog content creation from your board. Trello defines a “team” as a collection of boards and people that you can use to organize your blog and other aspects of your business. For instance, your marketing team may have just one board, but it’s part of a series of boards that correspond to divisions in your company (like Legal, Human Resources, etc.). Creating a board for your blog content is easy. Simply click on the Create New Board card. 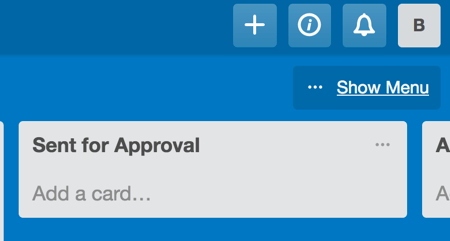 To set up a Trello board, click Create New Board. Name your board something straightforward, like My Company’s Blog. 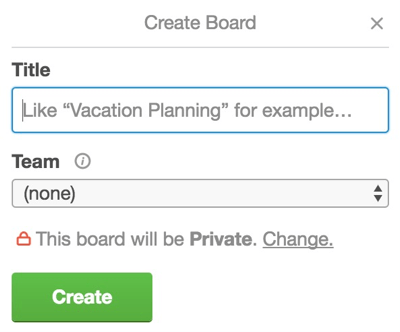 Enter a name for your Trello board and create a team if applicable. Once you’ve created your board, you can start adding lists to populate the board. Lists are vertical columns that act as their own categories for various topics and tasks. To support ideation-to-publication workflows, click Add a List… and name your first list Blog Ideas, or something similar. This is where all of your blog post suggestions will go. Subsequent lists on your board should reflect the content creation workflow in a logical fashion. For example, name the next list Articles Being Written (for content in progress). If you want to create a list for guest posts (which you’ll pitch to other blogs), create a list named Articles to Offer. You can use this list for all of the posts you think would be ideal for other blogs in a backlink campaign effort. Create Trello lists that match up with your blog workflow. If someone oversees the content standards for your blog, create a list titled Sent for Approval or something similar. Once you’ve written the first draft of an article, you’ll drag and drop the card from the Articles Being Written list to the Sent for Approval list. Typically, the editor or another content manager will review the card with the new blog post in this list. To round out the lists in your board, add a list named Approved/Pending for content that gets editorial approval and add a list named Published for content that’s posted on your blog. Continue adding lists to your Trello board for each phase of the blog content creation process. Now that you’ve set up your blog workflow on the board, it’s important to establish a system for kickstarting the content creation process. Usually, that starts with ideation, which is centered on the Blog Ideas list. A list like this is best reserved for pitches that writers submit to your blog. An editor or a senior person on your team should monitor this list to ensure that pitches from writers are received and then approved, denied, or sent back for clarification. Each time you receive a pitch, add a card to the Blog Ideas list. Cards are individual units within lists. One card usually corresponds to a task that you want to accomplish, such as a new pitch for a blog topic or a newly submitted article. To add a card, click Add a Card… at the bottom of the list or click the three dots icon (…) at the top right of the list and choose Add Card. Each time you receive a pitch, add a new card to your Blog Ideas list. When a team member adds a card to the Blog Ideas list, it’s important to notify the editor or senior person on your team. To do this, click on the card to open it, write a comment in the comment field, and address your comment to the relevant team member (click on the @ sign to find that person). Click Save to make the comment visible to the rest of the board. You can address your comment to specific team members. By using the handy in-card comment fields, team members can communicate with one another and move the ideation process along. Suppose a team member adds a pitch to the Blog Ideas list. The editor can either notify the writer to provide additional information or formally approve the idea and move it to the Articles Being Written list. 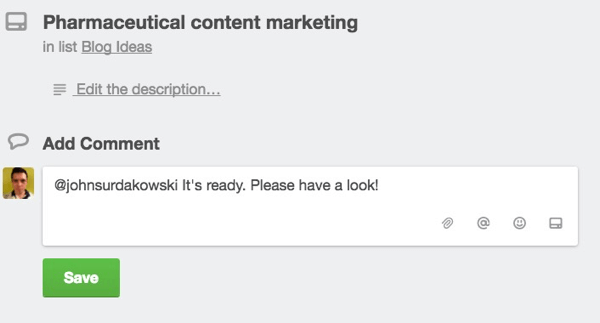 While there isn’t enough room to include your blog content on the card itself, you can add a link to it in the comment field. For instance, if your content lives in a Google Doc, include a link to it when you notify the editor that the draft is ready for review. A more elegant solution, though, is to attach content with Trello’s power-up feature. 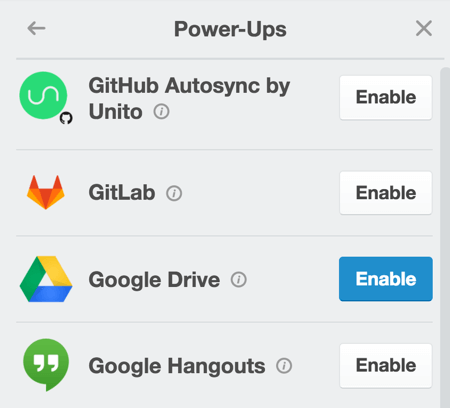 Power-ups are additional apps and tools that seamlessly integrate with Trello for enhanced performance. For instance, the Google Drive power-up will let your team share Google Drive documents, images, and videos easily within Trello. 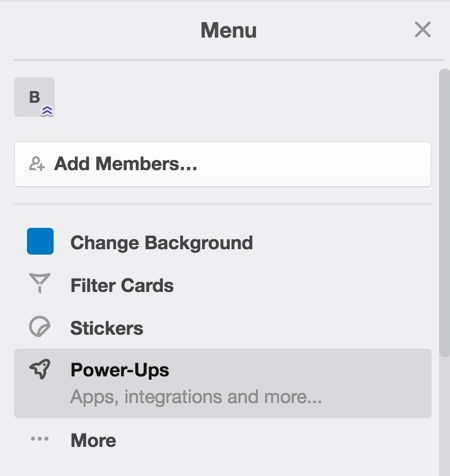 To enable a power-up, click Show Menu in the upper-right corner of the screen. Click the Show Menu link to open the menu. The menu that opens gives team members a top-down view of any action that happens on your team’s board. Select Power-Ups from the menu. Select Power-Ups from the drop-down menu. Choose from the list which power-up you want to enable. 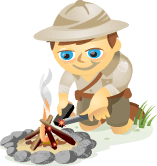 Note: You can choose only one power-up under the free plan; however, this should be sufficient if you’re using your board for blog content creation. Enable the Google Drive power-up to attach content from a Google Doc right onto the card. As content progresses through your workflow, drag and drop cards from left to right on your board. For example, if a card represents content that’s been completed, drag it from the Articles Being Written list to the Sent for Approval list. Drag and drop a card to move it to a different list. When a card is moved to the Sent for Approval list, editors and writers can seamlessly communicate within the card itself. They can notify one another to request changes or updates to the blog post. When the editor approves the article, move the card to the Approved/Pending list, where it’s just one stop away from being published. When articles are approved, move their cards to the Approved/Pending list. Finally, when the article goes live on your blog, pat yourself on the back and move the card to Published, its final stop on the board! Depending on how aggressively you publish content on your blog (larger blogs publish several times a week, while smaller ones tend to publish once a week or less frequently), your Published list will eventually have a lot of cards taking up room vertically on the screen. To clean up your board and make it clear what content is still being developed and what’s already live, archive the cards of blog posts that have already been published. To do this, open the card of the published post and click Archive in the Actions section. 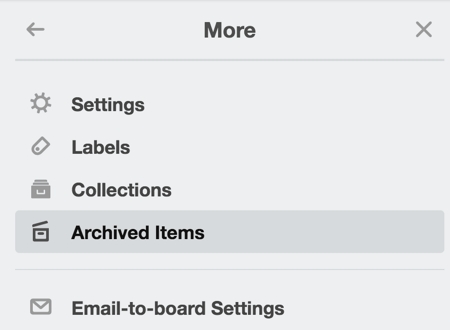 To archive a Trello card, open the card and click Archive. You’ll then see “This Card Is Archived” at the top-left corner of the card. 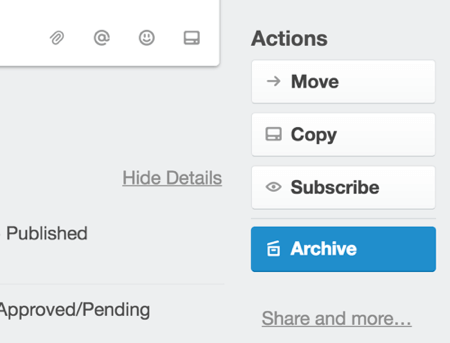 After you click Archive on a Trello card, you’ll see a message at the top of the screen confirming your action. To access archived content, open the menu on the right, select More, and then select Archived Items. You can access archived items from the right-hand menu. Trello is one of the best-known team/productivity tools available. Its growing popularity over the last few years is a testament to the great value it offers marketers. If you manage a blog, Trello will help you track your blog workflow all the way from brainstorming to publishing. It also provides excellent features if you produce blog content with a team. What do you think? 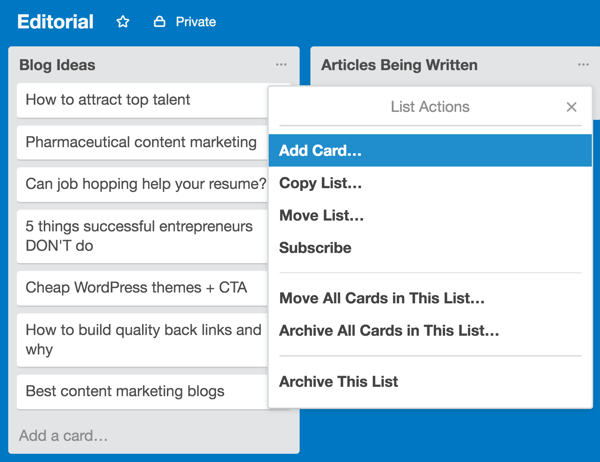 Have you tried using Trello to manage your blog content? What tips can you offer? Please share your thoughts in the comments. Marc’s a copywriter who runs Marc Schenker Copywriter. He specializes in business and marketing topics like e-commerce and conversions. Don’t forget to make his day liking his Facebook page!